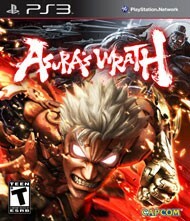 Thinking about picking up Capcom's Asura's Wrath when it releases on February 21st? See how some retailers are sweetening the pot with pre-order bonuses. One thing that's for certain is that is not Chris' blood on Asura's hands, but rather the life force of the assassinated emperor. You may think that you’ve done almost everything games have to offer, but you’ve never been stabbed into the earth by a guy standing on the moon. Capcom has revealed a new playable character for Asura's Wrath, who just so happens to be Asura's main rival. Capcom's upcoming Asura's Wrath is an unapologetically over-the-top take on the action genre, as these new screens demonstrate with explosions, overpowered attacks, and glowing-eyed muscly dudes. Capcom’s latest action game is an unapologetic caricature of the genre. I’ve seen few games deliver large scale, dynamic fights with such flair. The hack and slash game features some incredible set pieces, with at least one of the largest bosses seen in recent memory.